Home / Blog / The value of comfort – why quality Egyptian cotton just might be worth paying for. Egyptian cotton – is it worth it? There are so many renovation and makeover shows on TV these days that you’d be forgiven for thinking that that’s the way people always go about decorating and furnishing their homes; a big budget, a grand design – and as if by magic, the dream home appears. The reality of course is usually a bit less instant and a lot more haphazard. The early-adult years are full of frequent moves and changing circumstances – it takes quite a while before we find anywhere we can put down roots and really call ‘home’. During this time we tend to accumulate home furnishings; starting with the cheapest Ikea futon, fold-up chairs and roller blinds when we first live independently, and gradually replacing and upgrading as we move on, our relationships and tastes mature or our family and work circumstances change. But some items endure. Although I now have a family house and have done some renovation and redecorating of my own, I reflected the other day that I still own the ubiquitous and perfectly serviceable Billy bookcases I bought for my first flat, my nan’s rickety old nest of coffee tables and the (probably dangerous!) 60’s aluminium cooking pans my mum passed on to me when I left for university. What’s more, when I started doing social media work over a year ago for Dormitory, I realised that I had never managed to acquire a really decent set of bed linen in my adult life – though not for want of trying. When the numerous cheap and cheerful polyester and cotton mix duvet sets of my 20s began to wear out, I was delighted to see that in the intervening years, the internet had opened up a way of buying ‘quality’ bedlinen at surprisingly reasonable prices. Lots of online retailers sprang up offering high thread count Egyptian Cotton bedding at a fraction of the cost of those luxury lines I coveted in high-end department stores. At around £80-£100 for a 400 TC pure Egyptian Cotton duvet set, it was amazing value. Indeed it almost seemed too good to be true. And truth to tell, it actually was. When I unwrapped the beautifully branded packaging and unfurled my new bedding, I was slightly disappointed by the weight of the sheets. I had expected something more substantial for 400 Thread Count Egyptian cotton – something significantly ‘better’ than anything I had had before. But the sheets felt a little flimsy and when held up to the light had an almost transparent quality. The finish was nice and soft – but this softness seemed to wear off after a few washes. Also the detail on the set was minimal – basic stitching and ties rather than buttons for fastening the duvet. It was a perfectly good and functional bedding set of course, better than the cheap sets I’d had before, but certainly not the ‘special’ Egyptian cotton experience I had been hoping for. When I went on to start working with Dormitory and they gifted me a set of their best-selling white Brompton 400TC 100% Egyptian Cotton percale, I was curious to say the least. 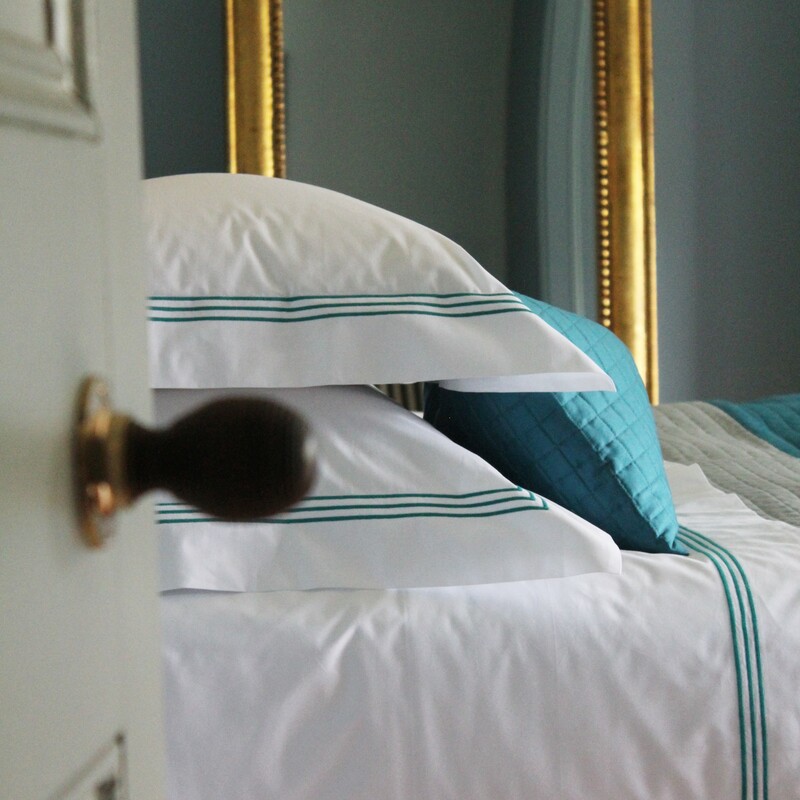 Having had a slightly unremarkable experience with Egyptian Cotton the first time round, I definitely needed convincing that that this would be different – especially as I knew that Dormitory bed linen came with a promise of quality and a realistic price tag to match. Luckily, (especially as I was about to start tweeting on their behalf!) I wasn’t disappointed. When I unwrapped my package, the sheets were crisp and smooth to the touch – they felt substantial and when I held them up to the light they were opaque, seemingly really tightly woven. 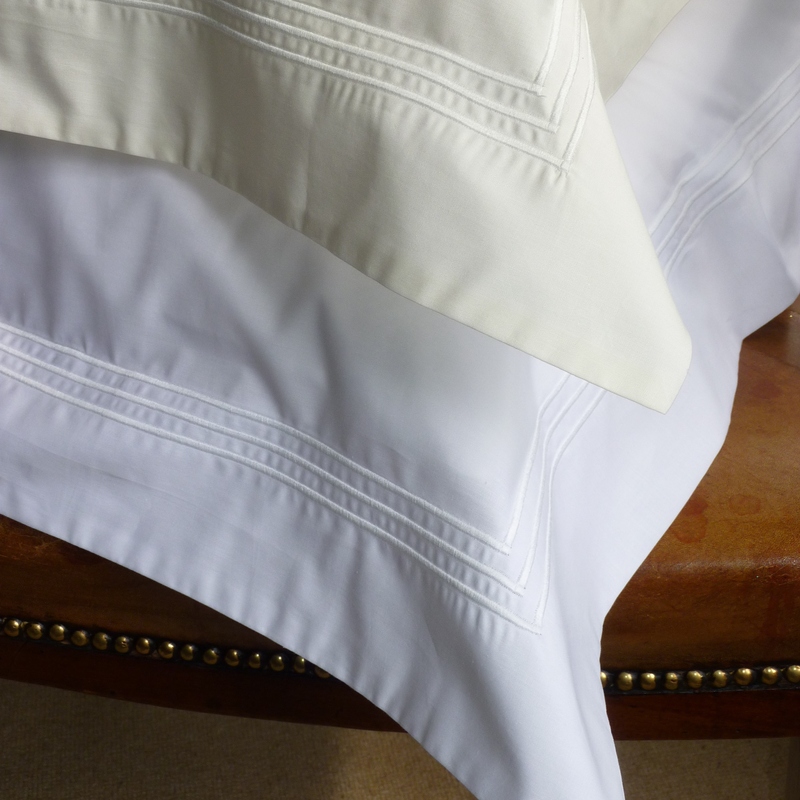 The attention to detail showed especially in the finishing – with a deep cuff on the duvet, three rows of contrasting cording around the edges and fine button closures. 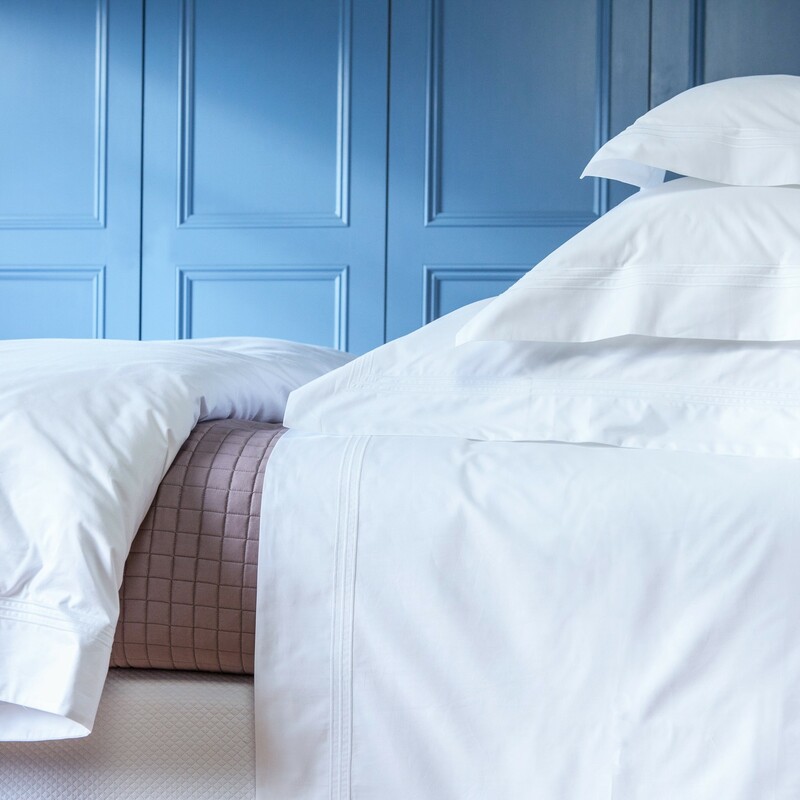 The ultimate proof of the bed linen is in the sleeping of course – and I’m happy to report that the bedding not only looked gorgeous on the bed – but felt even better, being cool and smoothly soft to the touch. Dormitory owners Cathy and Sue explained how the best Egyptian cotton is made from a longer staple with high quality finishing which makes the material super soft, durable and breathable. This means that the softness actually increases over time with washing rather than fading as with the cheaper yarns. I have also found this to be true – and the only drawback with my luxurious cotton sheets is that they have a tendency to crumple after washing as natural materials often do (and because I usually overfill my tumble dryer!). As I am far too lazy to iron anything at all, let alone bed sheets, I was pleased to learn that this wrinkling can easily be mitigated by removing sheets from the dryer while they are still slightly damp, shaking them out and applying a bit of tension and a linen mist. Pretty straightforward even for slovenly me! Have a look at the Dormitory bedding care guide here. A year and a half on and the bedding is going strong – still looking good, bright white and getting progressively softer. I have to say I have been converted. It seems that the luxurious Egyptian cotton experience is very real – if you are willing to spend a little extra for it. And why the hell not? We spend an average of 25 years of our lives in bed – we might as well be comfortable! Don’t take my word for it – contact Dormitory here to order a swatch of any of our linens.